We’re into the last few days before Christmas when most people are asking those burning questions. Have we got presents for everyone? Do we have enough food to cope with that one day when the shops aren’t open? Children, of course, are only concerned with whether the man in red will turn up with all the reindeer and a full sleigh. Christmas is a great time for traditions. We might forget what we did last week, but we can usually remember lots of Christmas days we’ve enjoyed – who was with us, where we spent the day, who set off the big argument by saying something out of place, and the great (and not-so-great!) presents we have given and received. I have spent Christmas in a number of countries, but until arriving in New Zealand they had all been in the northern hemisphere, so while some places were warmer than others, it was still winter. 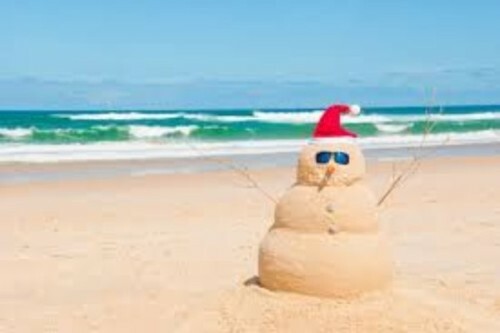 Living in the southern hemisphere creates new Christmas traditions. 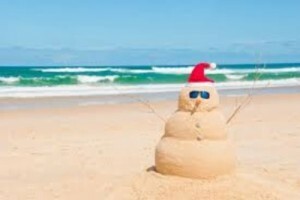 We celebrate Christmas in the middle of summer and the beach features high in many people’s plans. Ham and turkey are the traditional choices for Christmas lunch, although barbecues are popular. Pavlova is the favourite dessert. Today is the summer solstice — the longest day of the year. We have Christmas lights strung all around our deck and on the trees and shrubs in the garden, but as we have those long summer evenings the lights don’t actually come on until late! On the other hand we enjoy fresh strawberries and raspberries and all the other lovely summer fruits for Christmas dessert. Wherever you are and however you celebrate, I hope you have a wonderful time with family and friends making and enjoying your Christmas traditions.